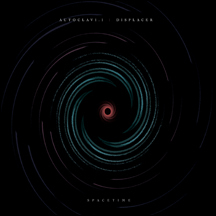 Prolific electronic artists Autoclav1.1 (Tony Young from the UK) and Displacer (Michael Morton from Canada-here making his WTII debut), have worked together in the past on many a remix and one split EP (The Star Atlas); so it makes perfect sense that they would eventually produce a full-length release. It was logical therefore, that their combined output has culminated in their latest album release, adopting the title, 'Spacetime'; an engaging and direct album, that combines lush melodies, pulsating rhythms, drifting ambience and razor sharp electronics, with a touch of commercial and 'universal' sensibilities to boot. Packaged in a visually emotive 6 panel digipak (designed by Morton's own imprint- Crime League), Autoclav1.1 and Displacer's 'Spacetime' crosses many a boundary; not all of which are defined by genre.